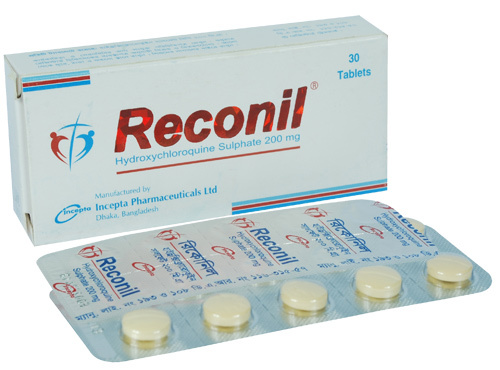 Reconil Tablet: Each film coated tablet contains Hydroxychloroquine Sulphate BP 200 mg.
Hydroxychloroquine Sulphate synthetically produced version of quinine. It acts as an immunosuppressant by inhibiting production of rheumatoid and acute phase reactants. It also accumulates in white blood cells, stabilizing lysosomal membranes and inhibiting the activity of many enzymes, including collagenase and the proteases that cause cartilage breakdown. It also acts by disrupting cell walls of infected red blood cells and kills the developing parasites. Hydroxychloroquine Sulphate tablets are for oral administration and are taken with food to avoid stomach upset. i) Acute and chronic rheumatoid arthritis: 400 to 600 mg daily. When good response is obtained (usually 4 to 8 weeks), dose can be reduced to 50%. ii) Systemic Lupus Erythematosus (SLE): 400 mg once or twice daily for several weeks or months depending on response of the patients. Maintenance dose is 200 to 400 mg daily. iii) Malaria: In adults, an initial dose of 800 mg followed by 400 mg in 6-8 hours and 400 mg on each of two consecutive days. For children a total dose representing 25 mg/kg is administered in 3 days as follows. First dose: 10 mg base/kg (but not exceeding a single dose of 620 mg base). Second dose: 5 mg base/kg (but not exceeding a single dose of 310 mg base) 6 hours after first dose. Third dose: 5 mg base/kg 18 hours after second dose. Fourth dose: 5 mg base/kg 24 hours after third dose. * Hydroxychloroquine Sulphate BP 200 mg equivalent to 155 mg of base. Generally Hydroxychloroquine Sulphate is well tolerated. However, few side effects like nausea, vomiting, stomach upset, loss of appetite, diarrhea, tiredness, weakness or headache and visual problem may occur the first several days. Children are especially sensitive to the 4-aminoquinoline compounds. Patients should be strongly warned to keep these drugs out of the reach of children. Opthalmologic examination requires in every 12 months. During pregnancy, this drug should be used only if clearly needed. Since small amounts of this medication are found in breast milk consult your doctor before medication.